Research has shown that loudspeakers sound best when their tweeter is positioned at or slightly above the ear of the listener. 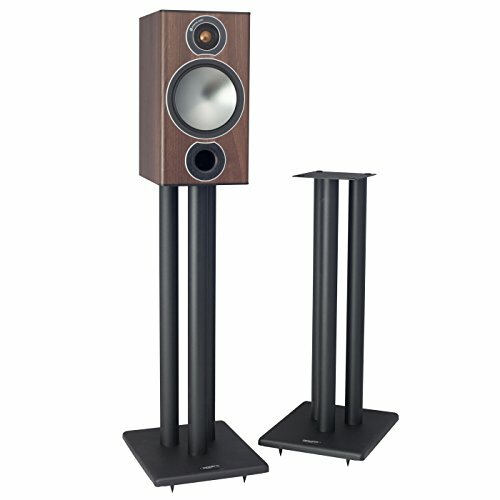 A high quality steel speaker stand like the Pangea Audio LS300 not only positions the speaker drivers at the best acoustic height, but it also rigidly holds the speaker for optimal bass performance. The Pangea Audio LS300 speaker stand boasts an all-steel design that is far superior to speaker stands made of wood, like most stands on the market today. Although it's more expensive, steel is a much better material for speaker stands. It doesn't 'hang onto' energy like wood. Instead, it releases energy very quickly instead of 'storing' it. Steel is extremely rigid, too. A well-designed all-steel stand like the LS300 solidly supports your speaker in a manner that wooden stands simply can't. The advantages of steel construction over wood include improved image focus, low mid-range coloration, and optimal bass performance. Nuts, bolts, spikes, and other hardware hold a stand together and make it perform optimally. Gustave Eiffel was one of the first modern engineers to realize and take advantage of the superiority of the triangle in his bridge and tower designs - including his most famous work, the Eiffel Tower. The triangle is one of nature's most rigid shapes. Pangea Audio's LS300 stand features three steel support columns, forming a very rigid triangular shape that offers an incredibly strong platform for improved speaker performance. One column has openings at the top and the bottom for hiding speaker cables. Two columns can be filled with sand or steel shot for even better vibration damping. The Pangea Audio LS300 features a 6" by 6" steel top plate to match a wide range of compact or monitor-type speakers. It also has an extra heavy duty 9.75" by 12" bottom plate. The LS300 comes complete with adjustable carpet-piercing bottom spikes. Four soft top pads are supplied for speaker isolation. If you have any questions about this product by Pangea Audio, contact us by completing and submitting the form below. If you are looking for a specif part number, please include it with your message.